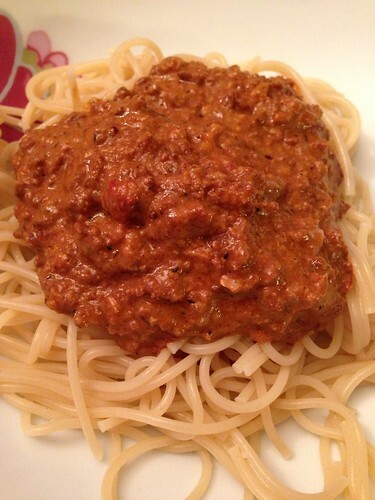 Perhaps it doesn't sound very appetizing, but I really couldn't call this a Bolognese. It's not a far stretch, but it has so many un-traditional ingredients that the name just wouldn't be fitting. However, it's a super good, and simple, sauce for pasta. I liked it. Husband loved it. The kids had seconds, and thirds. It was a big hit. First, melt the butter in a large pot, and brown the beef. When it's mostly browned, add the onion and keep frying for a few minutes. Add the water and beef stock cube, and cook until the water is mostly evaporated. Add all the flavorings - garlic, tomatoes, tomato paste, sriracha sauce, mustard, basil, soy sauce, black and white pepper. Cook for at least ten minutes, but longer if you have the time. Be careful to make sure the sauce doesn't burn though! Once you get your pasta boiling - we chose spaghetti - add the mushrooms and the cream. Season with more spice if you'd like, and salt - but we found it plenty salty anyway. ps. Don't listen to anyone's silly complaints, you can cook what you like, with whatever you want and I'm sure your food tastes a million times better than theirs.